The Salmonella typhimurium strains TA98, TA100, TA1535, TA1537 are included in the kit. The lyophilized strains are fully characterized for phenotypic characteristics and respond to diagnostic mutagens as required by OECD Guideline 4713. This kit can be upgraded by substitution or addition of our E. coli or Salmonella typhimurium strains to comply with the OECD Guideline 4713. For high-throughput-screening please ask for bulk ware. Escherichia coli strains ECDisc™ WP2 trp and WP2 trp, uvrA are included in the kit. The lyophilized strains are fully characterized for phenotypic characteristics and respond to diagnostic mutagens as required by OECD Guideline 4713. The µAmes test allows Ames testing compliant with OECD guideline 4713 and is suitable to evaluate mutagenicity of pharmaceutical impurities when only limited amounts are available (see Guideline:ICH M74). 1 Maron D., Ames B. Revised methods for the Salmonella mutagenicity test. Mutation Research 113(3-4):173-215, 1983. 2 Green M.H., Muriel W.J. 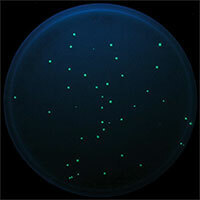 Mutagen testing using TRP+ reversion in Escherichia coli. Mutation Research 38(1):3-32, 1976.